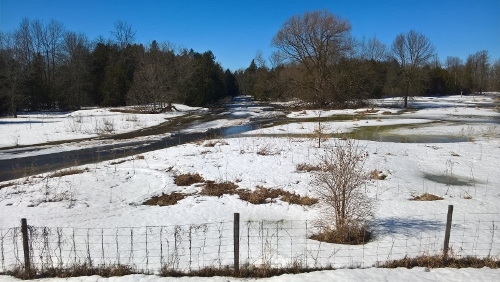 A slow thaw from Monday, above, to Friday, below. 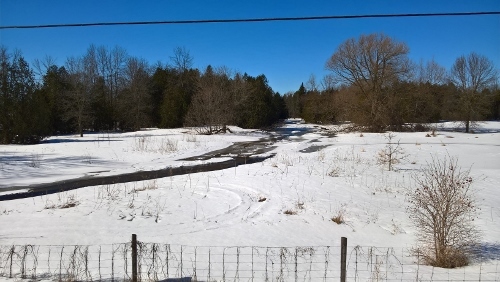 Although it spring is coming very slowly, we know it’s on its way. The red-winged black birds are back and so are many other early morning songsters. We even saw a robin last week! May this verse from Genesis 8 encourage you! Posted in: Canadian, God's Wonderful World, March, Nature Walk. When your child or teen has a concussion, is there anything you can do to help the healing process along? It turns out there is. We have had quite a few concussions in our family and, despite ER trips and doctors’ visits, we usually got no help besides the simple suggestion to rest and be careful. However, one child’s multiple concussions never really resolved until we saw an MD who specialized in them. After suffering through five major concussions and dealing with after effects for almost five years, she healed by doing what he suggested! Recently she experienced another concussion and with these methods the headaches, dizziness, and fogginess are abating within just weeks as opposed to months or years. Omega 3: I did not note the exact schedule and exact amounts the doctor recommended with the previous concussion, but as I recall it was similar to what follows. (With this current concussion we are using 9g/day for the first 10 days (3g in morning, 3g at lunch, 3 g in evening), then 6g for the next 10 days (skip the lunch dose), and then continuing with 3g in the morning as we have been doing since the previous concussion.) If healing seems complete and there is no history of post-concussion syndrome, one could probably stop these supplements after taking 3 grams a day for a month or two. Our daughter, who had experienced concussion symptoms for almost 5 years has been taking 2-3 grams daily since being treated by this specialist. This is the most important supplement of all; even if you use no others, please give your kid this one. Vitamin C: 500 mg 2x/day. Reduce this amount gradually after healing has taken place. N-Acetyl Cysteine (NAC): 500 mg 2x/day for two weeks, then reducing to once a day for another two weeks. Eat a high protein, low sugar diet. Drink 2 litres of water a day (vital both for healing and to minimize chances of another concussion). Relaxation (yoga, mindfulness, deep breathing; also, once he discovered we were Christian, ‘giving problems to God’). No-impact exercise, once there has been some healing (yoga, swimming), and walking. May God bless you and give your child healing after a concussion! Note: If at all possible see a medical professional who specializes in concussions and if the concussion seems severe go to ER. I am not a medical doctor and this is not professional advice. I’m sharing what our doctor told us, as one mom to another, because pediatric concussion doctors are rare, because such information is difficult to find, and because it’s best to start the supplements right after the concussion rather than waiting for a medical appointment. Note: Remember that the amounts given above were for a 110 pound teen; dosages might have to be adjusted for smaller and larger children. 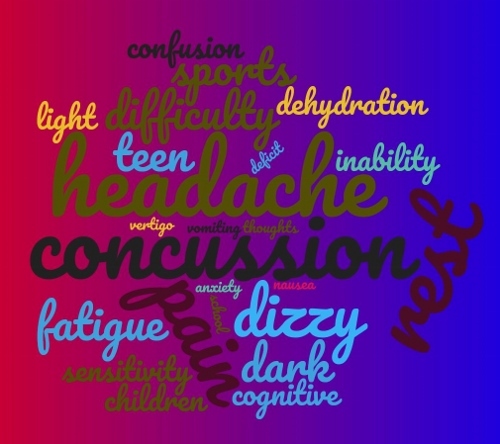 I tried to express the disorienting feeling of a concussion in the wordcloud image; many thanks to the WordClouds site. Posted in: For Your Information, Health, Life. 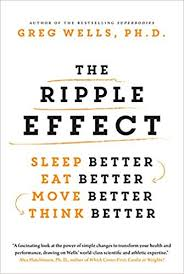 In The Ripple Effect, Greg Wells suggests that when we sleep better, we eat better. When we eat and sleep better, we move better. When we move better, we sleep better and we think better. When we think better, we sleep, eat, and move better. And often it takes only a 1% improvement in any area to start this positive spiral or even get out of a negative spiral. These are encouraging messages our teens need to hear, and many parts of it are written in such a compelling way that even reluctant teens get the message. This positive book carefully examines the four topics of sleeping, eating, moving, and thinking with details from the latest research and anecdotes from Wells’s work as a researcher in children’s exercise medicine and a professor of kinesiology. Each of the four sections ends with ‘Seven Keys’, practical ways to improve your health. The whole book is peppered with ‘1% Tips’ to begin improving your health in small but powerful ways. As a person with energy issues, I regularly read health books for both information and encouragement. This is one of the most comprehensive, up-to-date books I have read recently, and I shared parts of it with my teens. One of them is working on an advanced health/physical activity/kinesiology credit (we often don’t name self-initiated high school courses until they are completed) and this will likely be part of the required reading. The Ripple Effect is an independent voice that tells my teens the things I’ve learned over many years, things that will benefit their health for decades. Although I, myself, already practice many of things Wells recommends, reading such a book encourages me to keep on being disciplined about doing them; in this way it’s good for moms, too. After a night of poor sleep, planning and rule-based work are still possible, but creativity will suffer. Exercising outside instead of inside makes it more likely you will stick with it. Eating a wee bit of dark chocolate every day really does build health—this is not just wishful thinking of the self-indulgent. Short relaxation breaks several times a day are very effective. Just take a few proper deep breaths and relax muscle tension throughout the body. Cutting out 20 calories a day leads to a loss of 2 pounds a year, which is 20 pounds in 10 years—a potentially life-changing difference with zero effort. The Ripple Effect is a common-sense, research-based, practical guide to health, the kind of book that is desperately needed in a society where many put off caring for their bodies until ‘later’. It is not unlike other health books, but what is special about its message is that it emphasizes the interrelationship between the four basic aspects of health and gives hope that small changes can have powerful effects. The Ripple Effect could be used as a homeschool text for an advanced health or physical education class, or as science and math reading. It does contain speculations based on evolution as most such books do, but it also contains a lot of actual research and many practical applications of the research. A serious difficulty is that this book has no index and only a minimal table of contents, but taking careful notes can help a reader get around that. If you enjoyed this review, you might want to connect with me on GoodReads where I eventually share what I read or friend me on Facebook where I occasionally show up. Disclosure:I borrowed this book from the library but it is one I would love to own someday. This may be linked to Saturday Reviews, Booknificent Thursdays, 52 Books in 52 Weeks Challenge, Literacy Musings Monday, and The Book Nook as well as to Inspire Me Monday, Raising Homemakers, Friendship Friday, Make My Saturday Sweet. Posted in: 52 Books in 52 Weeks, Canadian, Health, High School, Reviews, Reviews: Nonfiction. We have some amazing clouds at times. With air masses often colliding over our region, our skyscapes are can be much more intriguing than those of the prairies where I grew up. But sometimes even non-dramatic clouds lead to questions. But, as you can tell by looking at the top cloud, something else was happening there. 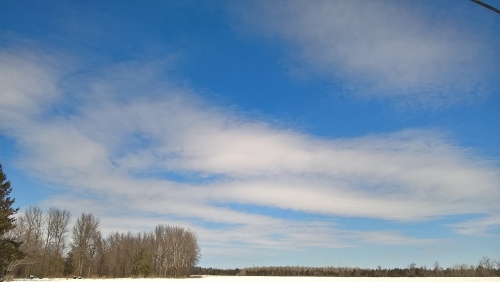 What was the wind doing to make these clouds so very different, and what was happening in the blue space between the polished clouds and this one, the space where the wind’s action was not made visible by clouds? When I turned around, I saw that much of the rest of the sky was like this top cloud. As a physicist, I know something about what happens at the molecular level in clouds, about condensation and ice crystal formation, temperature gradients, the effects of local humidity changes, and more, although the precise details are still beyond the understanding of researchers in the field. But what has fascinated me for years is the air motion that the clouds make visible, and that is something I do not understand at all. Air motion—wind—depends on long-range changes in temperature and density, but in the short range it is also affected by the subtle temperature and density alterations due to water vapor condensing into water droplets or crystalizing into snowflakes. 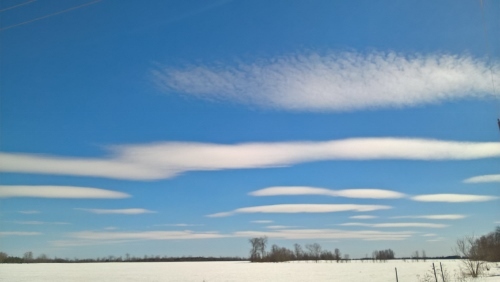 The incredible complexity of clouds, ranging from the effects of the addition of a few more water molecules to a growing snowflake to the enormous forces of global air movement, is something that mankind may never understand fully. But God does. God supervises clouds’ changes, moment by moment and molecule by molecule, integrating their effects, from shade to rain to storms, into human history! That leaves me open-mouthed with wonder. I recently reviewed a book about clouds and the cloud mania that spread through Europe in the 1800s, The Invention of Clouds by Richard Hamblyn. Posted in: Devotional, God's Wonderful World, March, Nature Photo, Nature Study. One of my favorite homeschooling activities over the years has been reading aloud to my kids, whatever their ages. Sometimes it seems as though reading aloud is just one more thing to do, but it actually saves homeschooling time and effort. It is certainly one of the most efficient and effective ways to learn. It can encourage our children in their more formal studies. It can give them context for the other things they learn. It is also a great way to relax together, to reduce cabin fever, or to redirect a bad day. And, finally, it is an excellent way to bond. 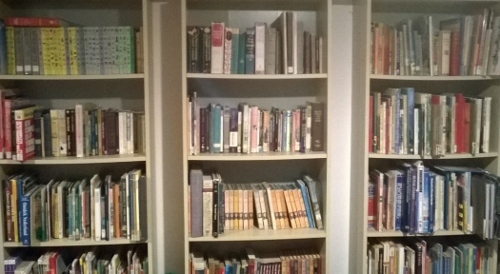 We have enjoyed an enormous number of books together through the years, ranging from picture books to adult biographies. Recently my teens and I finished a lively history of the Dutch fight against the sea, Of Dikes and Windmills by Peter Spier. Next we will likely reread an old favorite children’s book, Snow Treasure by Marie McSwigan about World War 2 in Norway. After that, maybe Chesterton’s Father Brown, or perhaps a few more nostalgic trips into beloved children’s books. Our favorite method of learning foreign languages includes reading aloud, too. At first I need to do a lot of translating, later I only explain a few main words, and eventually we just sit down with a good, thick book and enjoy. If you are new to reading aloud, choose any book you loved as a child (I find older books make much better read alouds, for whatever reason), sit down with your kids, and just start reading. We read the Bible aloud after every meal, and that is always an excellent thing to do. For more suggestions, check out our list of Top Twenty Books For Families to Read Aloud. I wrote a Reading Aloud Pep Talk almost a decade ago. Since then I have discussed reading aloud and have shared our lists for 2011-2014. If you want to check out our more recent read alouds, quite a few of them are on my GoodReads read aloud shelf. Reading aloud is so simple: Just start, and then fit in a bit every day or two. Enjoy! Alison explains how to keep kids engaged while reading aloud. My children have drawn pictures, practiced making knots, crocheted afghans, braided their hair, shelled beans, and so much more while I read aloud; Alison shares dozens more great ideas for both little ones and older kids. Heidi talks about books for little ones, from her family’s top 10 to series books with a printable. The books I read with my little ones became their favorites and even now I am ‘not allowed’ to pass them on because they are just too special. So choose these books carefully! I wish you joy as you read aloud with your family, no matter what their ages are! If you enjoyed this article, you might want to connect with me on GoodReads where I eventually share what I read or friend me on Facebook where I occasionally show up. 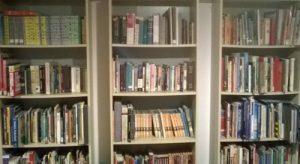 This may be linked to Literacy Musings Monday, and The Book Nook as well as to Inspire Me Monday, Christian Homemaking, Friendship Friday, Make My Saturday Sweet. Posted in: Homeschool Highlights, Homeschool Tips, Simple Joys.